Copyright © 2015　お茶の水女子大学ジェンダー研究所　〒112-8610 東京都文京区大塚2-1-1　Tel. 03-5978-5846　Fax. 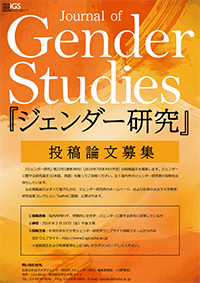 03-5978-5845 お茶の水女子大学ジェンダー研究所（IGS）-Institute for Gender Studies All rights reserved.